The survey "CLISCI2008" among climate scientists has been used to examine the terminology concerning two key concepts in climate science, namely, predictions and projections, as used among climate scientists. Established guidelines (e.g., by the Intergovernmental Panel on Climate Change) define predictions as probable developments, and projections as possible developments. 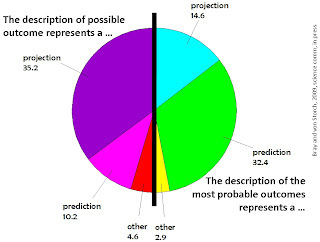 The survey data suggest that this terminology is not adopted, or only loosely adopted, by a significant minority of scientists - approximately 29% of the respondents falsely associate probable developments (i.e., predictions) with projections, and approximately 20% of the respondents falsely associate possible developments (i.e., projections) with predictions. The survey CliSci2008-survey has been mentioned before on this weblog. IMHO it's time to leave the politically based storylines and make some falsifiable predictions for the next decade. Projection, prediction and scenario are often confused and used interchangeably by the media. One has to look at the language in order to distinguish between prediction and projection. The use of words like: could, might, may, etc. Climate predictions in my view are not possible. There exist too many factors that are not understood. Nobody can predict the climate in 50 years time. You can guess - that's all. Anyone who claims he can is surely a charlatan. Of course a good scientist adjusts his hypothesis as new information is learned. I think this is maybe what Prof. Latif has done. I think a lot of care has to be exercised when assigning certainty. Some scientists have been irresponsibly certain of their "projections". Hans Erren, what means "IMHO"? P. Gosselin: "Predictions", in the sense of "probable developments", are possible if the forcing factors are predictable, and/or if the initial state is the most relevant parameter for the future deelopment. The former is mostly the case in the form of persistence or something similarly simple (forcing remains as it is, or trend of forcing change persists). In case of Greenhousegas (GHG) forcing an assumption of that sort can be used also for the next decade or so. In that case we are talking about real predictions, as opposed to estimates based on "story-lines" about future GHG-emissions (scenarios or projections; "possible developments"). Of course, nobody knows at this time, how good these predictions are; many people study this problem - and quite a few have reservations. The projections take the technical form of conditional predictions, i.e, predictions which depend on the (unknown) validity of the assumed forcing. Thus, technically, the terms are well defined, and make sense. The question is how they are used, and which impact they have, in the public. I noticed that in the UK the term "predictions" is often used not only by the media and policymakers but also by scientists, when they actually refer to projections. I wonder why that is so. Has it something to do with different uses of the language called "English" in the US and in the UK? 1. A prediction is something you can make if you know the present conditions and the future behaviour of all factors and conditions. 2. A projection is simply an extrapolation of the known present conditions. It ignores possible future impacts from external factors. It asumes that there won't be any, or they will be negligible. 3. A scenario is only one variation from an infinite number of future possibilities. 4. In the English language, I think the media are not really interested in reporting this topic truthfully. They are purposely being inaccurate with the objective of misleading the reader. Climate science has had the habit of making projections and scenarios, and selling them to the public as predictions. This is in my view a subtle type of fraud. There is no way they can predict with sufficient certainty what the sun and oceans will do. They don't have anywhere near enough information about them. Those who claim otherwise are either unqualified or dishonest. -"Climate projections are distinguished from climate predictions in order to emphasize that climate projections depend upon the emission/concentration/radiative forcing scenario used, which are based on assumptions concerning, for example, future socioeconomic and technological developments that may or may not be realized." "Essentially, a projection of climate change differs from a prediction in that a scenario of future emissions is assumed without giving it any specific likelihood of occurrence. A projection thus tells us what the climate response would be when assuming a future forcing scenario." Thus, projections and scenarios are the same. Giorgi, F. (2005). Climate change prediction. Climatic Change, 73, 239-265. Agree, I find the usage of "predictions" instead of "projections" confusing and counterproductive. I wonder of it is just sloppy language or done on purpose. Sloppy language? The people in this business are quite well educated, many are at the top of their fields and are very familiar with such nuances. It's strange how many include a good dose of emotion when delivering their packaged projections to the public. Maybe the IPCC should emphasize projected temperatures are just possible temperatures. And only possible as much as climate science has it right. Or they could just say "possible temperatures", instead of "projected temperatures". But then, the scare could be not so effective ... I wonder why. A quick search in our US media Corpus (1981-2007) shows that PREDICTION* occurs more than twice as often as PROJECTION* (ca. 9,000 v 4,000 times). Bear in mind also that there are Climate Prediction Centers (NOAA, Hadley). Undoubtedly, prediction is the preferred term suggesting the ability to foresee. What also appears in early media reports is the hope and the promise that with increased research funding the ability to predict will increase. Or also, if you are drawing, you are representing something on a perspective plane [same source]. 11,12 - This is a common problem when dealing with language that it is differently understood in different quarters. Therefore I listed the IPCC definition as given by the IPCC Glossary. Approaching an issue with one's own terminology often leads to the disaster of failing communication. Reiner - clearly the problem is that in the public, also because of sloppy or otherwise inadequate communication by scientists and their communication, the term "prediction" is heard. Therefore you find it more often in the media corpus. On the other hand, most climate scientists - see the CLISCI2008 survey - understand the terminology as implied by the IPCC wording. That NCEP has its name with a P = prediction may originally be related to attempts in predicting the coming year's El Nino conditions, an effort which commanded lots of attention in the 1980s and 1990s. Hadley, - hm, that is a problem. I think they use the term systematically not in the IPCC meaning, but as if prediction = projection. That's why I was wondering if it is a problem of British English (Britts have a problem in speaking scientific English). The issue is getting even more complicated now, when real forecasts / predictions of the statistics of weather (climate) are attempted for the next one or two decades aka Keenlyside & Latif. The Green & Scott paper is not very helpful, as they seem not have tried to disentangle the different concepts adequately. I would wish that such researchers would communicate with people from the field before embarking on such an effort. Just to clarify words and concepts. Or the reviewers should have helped. Such linguistic problems, and that's what they are cause lots of excitement between sceptics and main-streamers - but these problems could easily be avoided if w could agree on a common language. The IPCC has tried to come up with useful terminology, s let's use it. Hans - why do you give a charitable interpretation of NOAA's label but not Hadley's? Cannot see the difference. Apart, prediction will always win in terms of popularity (also among scientists) becuase it allows to promise more certain knowledge in the future. This is what politicians want, they want ABOVE ALL probable scenarios, not just possible scenarios. And scientists collude. It is therefore not a solution to blame the media. Reiner, I did not want to blame the media (we have the media, which we deserve); the word "prediction" arrived in the public arena because some scientists brought it there, sure. But within teh scientific community the terminology is mostly used as suggested by IPCC -a s demonstated by CLISCI2008. "There is a 60 per cent probability that the world's population will not exceed 10 billion people before 2100"
I would not know how to attach probabilities to the scenarios - and what would they mean? A probability is the frequency of outcomes of a certain random experiment. What would the random experiment be here? Or would it be a purely subjective probability? What would be the utility of such a probability? Ore differently: what is the utility of a scenario without a probability? Should we open a new thread to discuss these issues? I've actually noodled about this, Hans. I'm sure there is some answer in terms of Bayesian stats (which I have never studied). But I think the probabililty shoul represent your INDIFFERENCE odds for betting. IOW, if you are required to give a probability, knowing that your counterparty may decide to take EITHER side of the bet (and assume a lot of money on the line, no hedging or help on the side)...at what probability are you indifferent? It's like asking one child to cut the cake in two pieces and allowing the other to pick. concerning including your survey on the page. Are you planning to peer-review and publish it? I think that it would then be the most important survey on the page, whereas now I'm somewhat hard-pressed to get it to show up there at all. 1. How important is prediction to climate science? 2. Does climate science need to predict in order to be useful? My own sense is that the majority would say, respectively, "very important," and "definitely yes." We could then have a very interesting discussion about the many consequences of this mindset. For climate science itself, for climate science policy, and for those who look to climate science for actual help in dealing with climate change. "Often, in our communication efforts, scientists are confronted with critical issues of language and framing. A case in point is a book I recently co-authored with Penn State colleague Lee Kump, called Dire Predictions: Understanding Global Warming. The purists among my colleagues would rightly point out that the potential future climate changes we describe, are, technically speaking, projections rather than predictions because the climate models are driven by hypothetical pathways of future fossil fuel burning (i.e. conceivable but not predicted futures). But Dire Projections doesn’t quite roll off the tongue. And it doesn’t convey — in the common vernacular — what the models indicate: Climate change could pose a very real threat to society and the environment. In this case, use of the more technically “correct” term is actually less likely to convey the key implications to a lay audience." When science meets politics correct becomes "correct." I don't have an issue with Mike using Prediction in his title. For a popular science book, it makes sense. And he does at least show he knows the difference. Now, he does other bad stuff, sure. But let's not just assume any time he is involved, he must be wrong. For instance, that letter to the editor was DEAD ON in pinning Michaels down for being a professional op ed writer...not a real publishing scientist...and counterposing Christy as someone who writes real papers. 1. science (noun) the art of changing, hiding or deleting data in order to confirm or support a desired outcome. 2. trick (noun) a clever scientific solution for hiding an inconvenient reality. 3. crap (noun) any information, data or studies that contradict the AGW hypothesis and are inconvenient to real climate scientists. 4. denialist (noun) a pseudo-scientist, or any person, who has the gall of doubting to any degree the AGW hypothesis. 5. prediction (noun) a forecast of catastrophic events projected by manmade computer models and claimed to be likely or very likely, even if they are not. 6. Medieval Warm Period (noun) a fabled period of warm weather claimed to have occurred by denialists in the northern hemisphere from 1000 to 1200 A.D., but did not really happen. 7. mitigation (noun) the act by governments of regulating nature or God. 8. real climate scientist (noun) a highly trained person working in the field of climatology who actively practices tricks and science (see above). 9. flat-earther (noun) any person who doubts the hypothesis of manmade catastrophic GW to any degree. Synonym: denialist. 10. democracy (noun) an undesirable system of government that obstructs world leaders from mitigating impending, model-projected manmade climate disasters. 11. climate change (noun) a recent phenomenon that began in the 19th century, which had never existed before and entails changes in longer term weather patterns that are solely caused by human activity. 12. consensus (noun) a system in climate science used for proving a hypothesis. If a certain circle of politically correct scientists agrees on a hypothesis, then it is considered to be settled. Neither data nor new discoveries can nullify science by consensus. 13. settled (adjective) irrevocably agreed on, through the assertion of authority and claim to consensus. 14. temperature decline (noun) a short-term decline in global temperature, unforeseen by models and due to natural variations. Synonym: weather. 15. temperature increase (noun) manmade global warming predicted by models. Synonym: global warming. 16. natural variation (noun) an explanation for unexpected temperature declines not foreseen by models. 17. sun (noun) a star near the planet Earth that has the unique property of a steady, unchanging radiative output, with a fixed solar constant and benign constant behaviour. 18. peer review (noun) the process of rigorously checking over and approving a paper that supports the AGW hypothesis, and done so only by scientists who agree with the paper. 19. rigorous (adjective) having the quality of ignoring faults in AGW papers and putting such papers on the fast track to publication in prestigious scientific journals. 20. prestigious scientific journal (noun) any journal that agrees with the AGW hypothesis and applies rigorous peer-review, yet does not require access to raw data and codes as conditions for publication. 21. FOIA (noun) Freedom of Information Act. A law that greatly inconveniences busy public scientists by requiring them to disclose their data and codes to the public and to denialists. 22. climate criminal (noun) any sceptic, denialist or flat-earther who promotes and supports democracy. Once you learn these basic terms, understanding climate science becomes a whole lot easier! I wish to congratulate Prof von Storch on his new blog, which I'm sure will be a big success. I hope he will consider writing some posts in German too, as I believe the German public would be well-served by his views. As all sweeping assertions, this one is not accurate nor fair. I know many climate researchers that dont fit in this description, actually most of them. Perhaps the problem is that they are not interested in interacting with the broad public, something that I can also understand very well. The so called 'Team' is by light-years not representative of the whole comunity. You are going to win VERY few followers to the middle path (and it is not really a "middle" path but an HONEST path). Those who are "sided" essentially have NO interest in actually learning more UNLESS they learn points to help their pre-existing bias. When they interact, this is what they look for. This is what almost all political blogs are like. This is what the community on RC and CA (and WUWT and OM, etc.) are like. You may find a very few places like Volokh Conspiracy that have genuine interest in truth, regardless of which position it supports (does not mean they don't have "sides"...but are willing to look analytically at things that go against their side). The RCers and the CAers are FAR from the curiosity and willingness to disprove hypotheses of a natural scientist. Solid state chemistry and physics are better. Please don't take my little dictionary too seriously...it is meant to be humourous and taken with irony. I think it's clear which circle of scientists it is aimed at. Still I feel that it reflects how climate science has been operated over the last years. Climate science was vitually hijacked by a certain destructive groupthink. Do you really believe that the field of climate science deserves a clean reputation after all that has happened? No, it must go through a period of heavy criticism and be purged of its wrongness. Otherwise things will just continue as before. Science must not be about suppressing other views, splicing data sets, erasing hisory and hiding data. It has to be open. Otherwise my dictionary starts to become valid. 'We' are right and 'they' are wrong? 'We' are honest and 'they' are not? Interesting. Hm. Really. #27 >Climate science was vitually hijacked by a certain destructive groupthink. This is really a key problem. This group thinking and all ideology coming along ruins the reputation of climate science, potentially impacting to reputation of science in general. But more worse, it had a significant impact on the education of young scientist. PhDs and young Postdocs which have been educated in climate science the last years are severly impacted by this group thinking, and dont even see the problem with the ´Teams´ behaving. Considering that we have educated really a lot of young scientists in that field during the last decade (look at the ´age structure from Denis and Hans survey), this is something which really worries me. >Do you really believe that the field of climate science deserves a clean reputation after all that has happened? >No, it must go through a period of heavy criticism and be purged of its wrongness. Otherwise things will just continue as before. are only a start point. The very big question is how to deal with the next IPCC report? Do climate scientist agree again to accept that the modelling strategy is arranged in internal circles (the ´leading model´circles of course) ? Or will there be a possibility to discuss the validity of the models, the setup and the parameterisations chosen for the purpose? Will we again face the situation that with the modelling chapter the strategy of peer reviewed science is flipped around? in the following years and totally dominate the research funding in climate science and specifically in other related disciplines (climate impact research)? Perhaps we are seeing things from a different perspective. I guess you are not an active climolotologist, so you have a perspective from outside, which is interesting on its own, and we will like to learn from. I wanted to highlight that 'usual suspects' is a really small, but so far powerul, group within climate science, that has also found allies outside. But please you can believe that within climate science there is a huge number of honest and silent people. For instance, You would be surprised to know how strongly unpopular within climate science some leading figures of the 'team' are. I agree with you that our 'reputation' within the broad public opinion has taken a hard blow, and that something has to be done, ideally by ourselves. But I dont really know exactly what. This being said, I also think that criticism from outside should be as objective as possible. 31 Eduardo, you highlight the problem - why have so many of the honest climate scientists remained silent? There were very few in the climate science field (You two of course!!) who have spoken out against the hockey stick construction, even though it is now clear from the leaked emails that many people knew it was dubious. It would be interesting if you could explain more about leading members of the 'team' being unpopular. Your blog is a step in the right direction. I'm going to vote for "sloppy thinking". To quote: "define predictions as probable developments, and projections as possible developments." "Developments" means "the course of future events". "Predictions" and "projections" are statements about future events and ,ideally, are associated with some probability to represent out uncertainty. So if predictions are "probable" and projections are merely "possible" then the distinction can only be one of the probability we associate with the event. Though, since in ordinary language what is "probable" must necessarily be "possible", all predictions are also projections. Does it matter? It appears that the claim has been made that projections can't be falsified because they weren't predictions. But no probabilistic statement about the future can be falsified so predictions associated with a probability can't be falsified either. My conclusion is that the distinction is not useful. What is useful is to associate a probability with your prediction/projection so the risks can be reasonably assessed. Note: I am not an expert, just someone with an opinion. I agree; being honest and silent in climate science isn't a winning concept in this situation. At Climate Audit, Steve McIntyre made a similar observation: the only scientists commenting on Climategate at all were those who have already spoken against for example the hockey stick. Where are all the other scientists? Further update: The reference to the 2003 survey has now been removed from Wikipedia, and the link to the 2008 survey with it. There is some support there for putting it back... In any event, it would help if it were being published. - Many conduct perfectly 'honest science' but are not bothered by seeing a bit of overselling if they feel it helps the good cause. I think they are wrong because in the long-run it is damaging also for the 'good' cause. - Others find themselves between two evils: the 'team' and the skeptics, and think that the skeptics are the more dangerous evil. This feeling is reinforced because, although some of the skeptics may have a point, these points are misused by politically interested parties, mainly in the USA. - Some of the bluntest arguments of the skeptics are wrong (yes, sorry), although not all. In an embroiled situation like the present one, a message with certainties and uncertainties is difficult to bring across, and most scientist do not want to be seen by colleagues as related to wrong scientific positions. - As in the general population, many don't want to comment in public. This entails risks and requires time. To Dennis Bray: I know that the survey is available; it was posted here. The discussion at wikipedia currently is whether a non-peer-reviewed survey should be listed. So my question is, Are you planning to publish it in a peer-reviewed journal? If not, I'm just pointing out that it's getting in the way at wikipedia. There are and will be peer reviewed publications from selections of the survey results but a complete entity - i.e. the entire survey in one piece - will not be published other than as the PDF already on the web. A hundred or so pages of descriptive statistics are not very attractive as a peer reviewed publication. Neither the 1996 nor the 2003 surveys were 'published' in their entirety but were nonetheless listed n wipedia. Hope that helps. I have an alternative view based on apparent usage rather than definition. It seems to me that implicit in the use of "prediction" is the idea that the events in question will occur, albeit with some uncertainty. And that implicit in "projection" is the idea that the events will not occur unless some conditions, not presently met, are found to be true. If this is right then predictions might be falsified in practical terms (though never in strictly logical terms) but projections will only be falsified (practically) if their conditions are met in practice. Otherwise they become merely counter-factual arguments. This seems to me to reflect the way the terms are used better than the way they're defined. My conclusion this time is that the distinction is useful but that it is frequently missed. There is a paper concerning consensus now in the review process and there is also a paper concerning climate models nearing the submission stage. There is enough material for a significant number of papers but I am not as certain that there is a significant amount of reviewer/editor interest to publish them. Thank you for your answer! Your explanations seem plausible to me, but I must however repeat my view that the time for being silent is long gone. This because the result of Climategate is that the credibility of the whole field of climate research is being questioned. If I were a climate scientist and were convinced that I had enough knowledge to conclude that the emission of CO2 is likely to cause serious damage, I definitely wouldn't stay silent. I'd be really mad with the Team for causing damage to the credibility of climate research, and I would speak out, not necessarily by criticising these scientists, but by defending the AGW-hypothesis. Some scientists, like you and Hans Von Storch, do this, but the majority is completely silent, and I frankly find this odd. I really appreciate your view on “overselling”. That the media does this is bad enough, but when scientists let this pass, or worse, encourage it, this damages the credibility of science. Of course some of the skeptic arguments are wrong, otherwise we wouldn't have any scientists defending the hypothesis ( at least I hope so.. : ), but the problem is how to know which are wrong, which are right and where there isn't enough knowledge to say what is the truth. An article on this subject would be very welcome (at least if it didn't only contain the most common “straw men”).